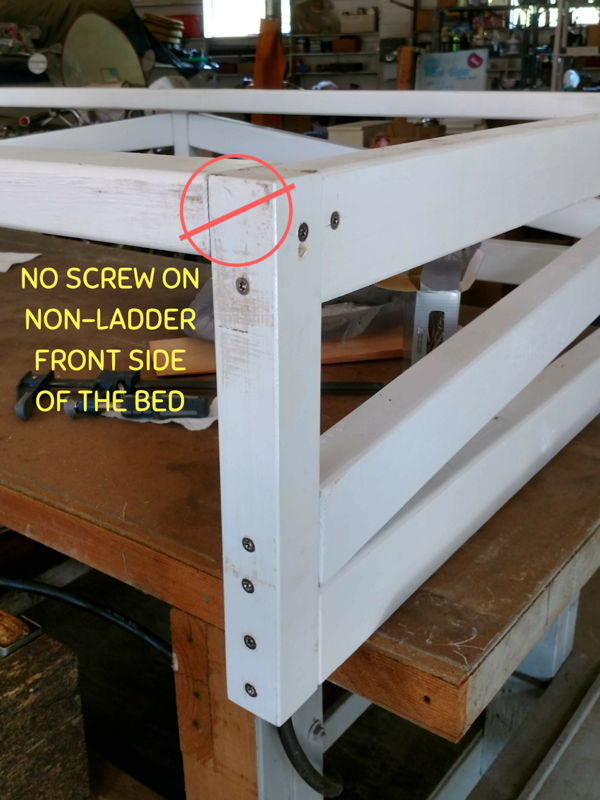 This post is part of a tutorial on turning an IKEA KURA loft bed into a bunk bed over a trundle. For the other pages in this series, go to the Introduction and Disclaimer, the Parts List, Prepping the Wood, Part 1 of Assembly, Cross Bracing, and Attaching the Beds. Take the rectangle you completed in step six and stand it up on its 2-inch wide side as shown. Lay one of the 38-1/4" 2x3 boards perpendicular to it at the base on its 2-inch side as shown. 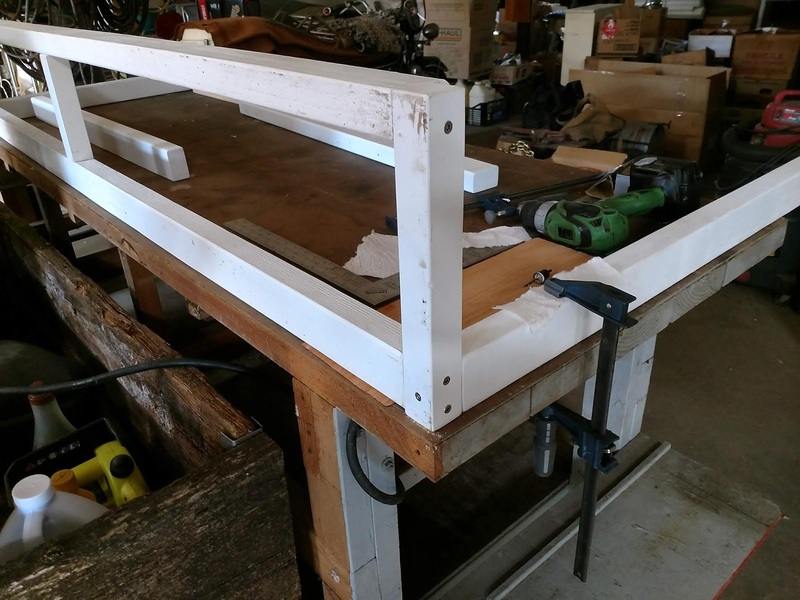 Use clamps to hold everything in place and make sure everything is square. Drill one screw hole from the previously completed rectangle into the end of the 2x3 as shown being careful to place it between the two screws going the other direction. Use a 3-inch screw. 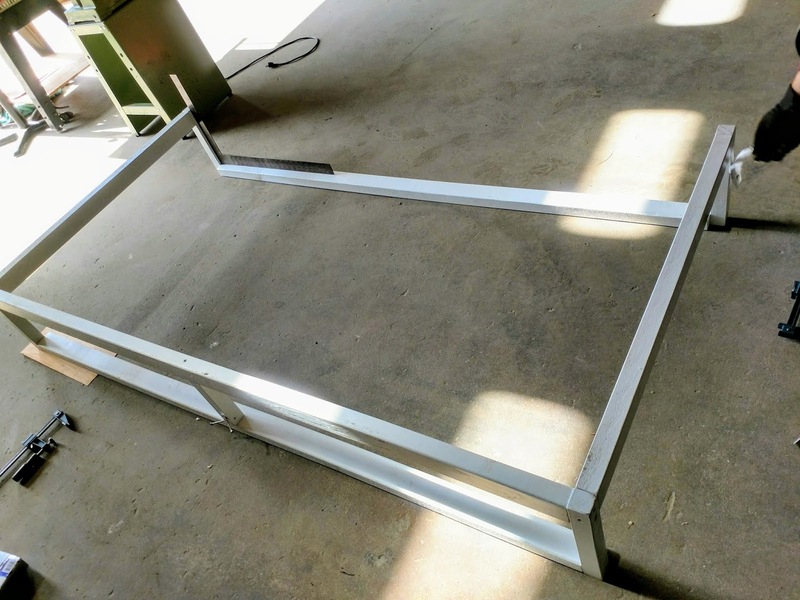 Repeat the previous step with another 38-1/4" 2x3 on the other side of the rectangle. You will end up with an angled "C" shape when you are done. 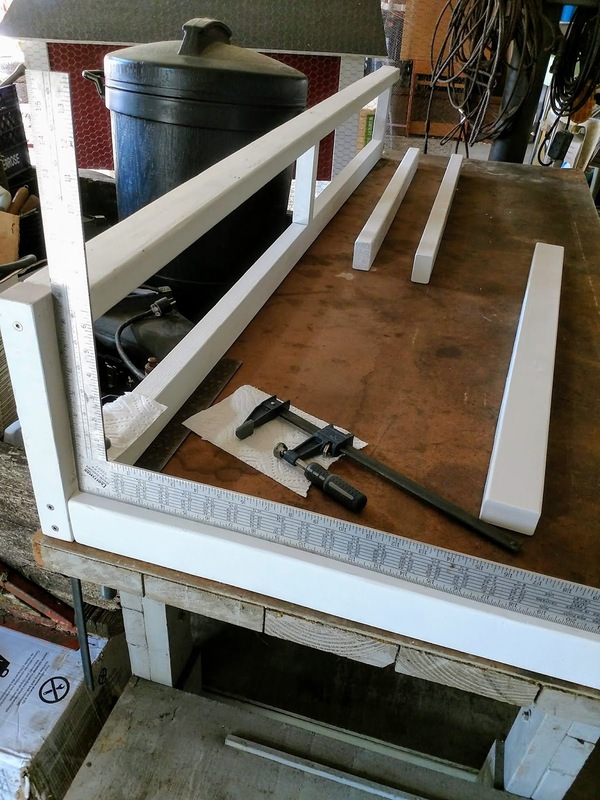 At this point, you need to flip the bed frame over to attach the front section that you created in step seven. Moving the frame at this point is a bit of a pain since the braces on the ends of the bed are only screwed in with one screw. Be careful and have someone there to help you avoid tearing out the screws when you flip it over. (This is why it would be easier to do the top braces first rather than the bottom braces, but hindsight is 20/20.) You will also need a second set of hands to help you hold everything when you clamp it in place. We didn't have a workbench big enough to fit the bed on at this point, so we moved our project to the shop floor. Keep in mind that the floor may not be level (ours wasn't) since many garage bay floors are inclined to keep water or other liquids from pooling inside the building. Clamp the pieces together so that the long 2x3 from step seven is at the bottom. The 2x3s at the bottom of the long sides should both be laying flat so that the 3-inch sides are on the floor. See the photo. You want the bed base to be level all across the part that is on the floor because this is what your IKEA KURA loft bed is going to be sitting on when you are all finished. Do your best to make sure all of the angles are square, but there will be a bit of wobble until you add the rest of the braces. Attach the legs to the head and foot braces using two 3-inch screws on each side. Screw placement is not as important here because there will be no cross screws to worry about this time. Flip the bed over and slide one of the two remaining 38-1/4" 2x3s into the gap between the legs at one end of the bed. Make sure that the narrow edge is facing up and that the top is level with the rest of the boards. (Again, this is what your KURA bed will be resting on, so it needs to be level.) 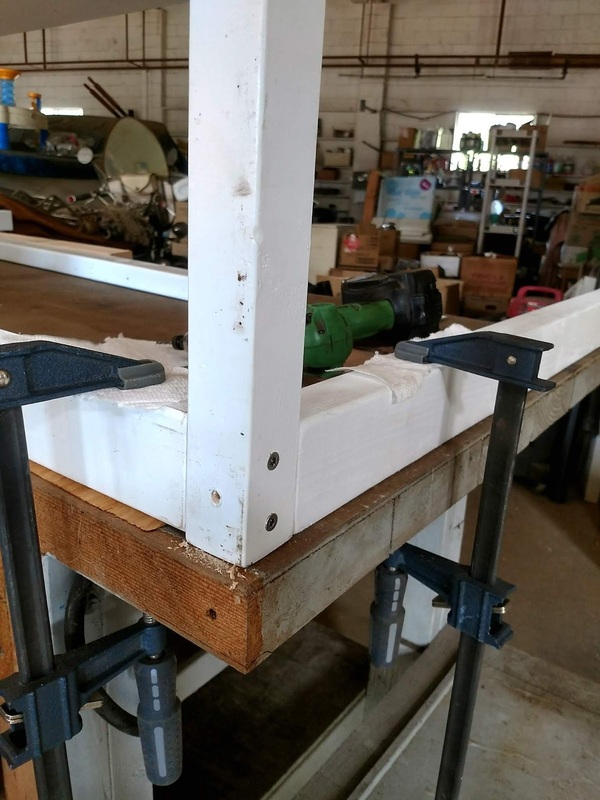 The short 2x3 should be flush with the part of the long 2x3 that protrudes beyond the bed leg. 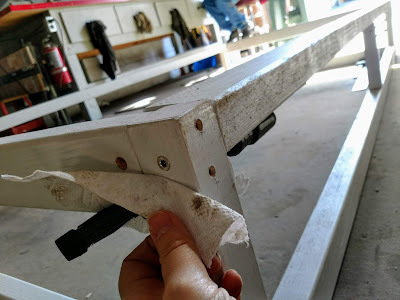 Starting with the legs that will be at the back of the bed (the part that connects to the very first rectangle you built in the first few steps of the project), drill three holes using the hole placement shown above. 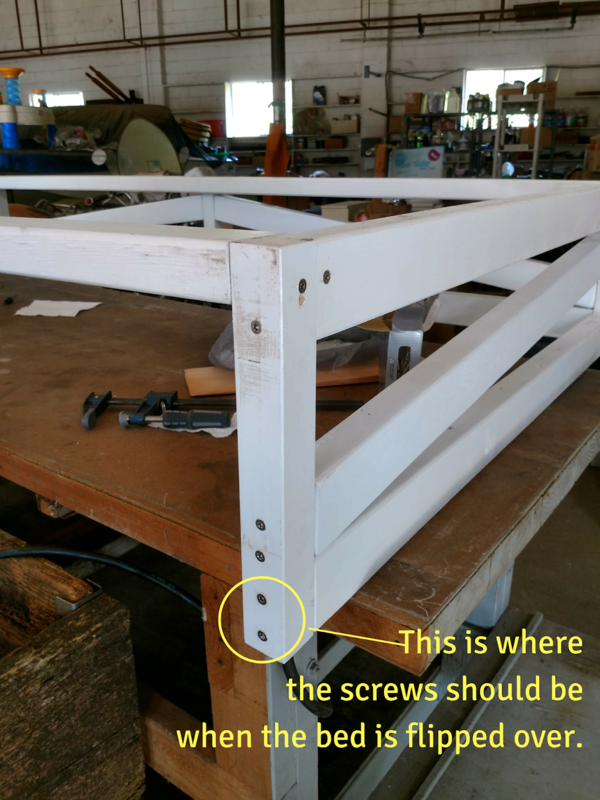 Insert three 3-inch screws to hold the wood in place. Repeat the previous step on the other back leg of the bed and again on whichever front leg WILL HAVE THE KURA LADDER ATTACHED. This is important. You do not want to put the top screw in on the front side of the bed base where it will connect to the KURA bed side that DOES NOT have the ladder. You need to reserve that spot for a screw that will be attached when the beds are connected. The non-ladder side should have the screw placement shown above. At this point, the bed base is complete aside from the cross braces, which will be added next.